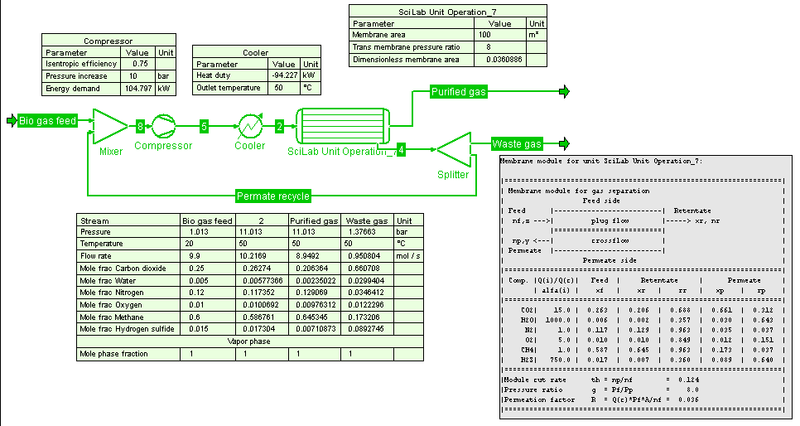 The SciLab CAPE-OPEN Unit Operation is a unit operation implementation for which the calculations can be entered in SciLab. To get started with the SciLab CAPE-OPEN unit operation, start your CAPE-OPEN capable simulation environment. Insert a SciLab CAPE-OPEN unit operation. Edit a unit operation. Define feed and product ports. Go back to the simulation environment and connect streams to the ports. Now edit the unit operation again. On the SciLab tab you can enter the SciLab calculation script. This script can obtain feed properties using the getFeedProp function. It can then do calculations, using thermo-dynamic calculations that are based on the underlying thermodynamic system of the simulation environment the unit operation is running in. It must specify all the product streams using setProduct, that takes composition and flow as well as two other properties required to specify the thermodynamic phase equilibrium. The SciLab unit operation will function in CAPE-OPEN compliant simulation environments that support version 1.1 thermodynamics. It has been tested in the COCO simulator and ProSimPlus 3. The 32-bit version of SciLab 5.02 (or higher) or the 64-bit version of SciLab 5.4 (or higher) must be installed and running at your system. You can obtain a copy of SciLab from http://www.SciLab.org/. The SciLab CAPE-OPEN Unit Operation installer is available from the Downloads Page. The SciLab CAPE-OPEN Unit Operation is free of charge for personal and academic use. For commercial use, a license fee must be paid. Licensing is on a per-person basis (and can be used on multiple computers). Commercial license fee is € 150,- (if you are outside the European union or inside Spain, VAT of 21% is applicable). Please see the Downloads page for downloading the SciLab CAPE-OPEN Unit Operation.